We believe coffee trees come from Ethiopia, and people recognised them as something special around the 15th century. Today coffee is grown in over 50 countries around the equator where the weather is warm and humid. Technically, there are over 100 species of coffee, yet, only two species have economic significance: Arabica and Robusta. You’ve met them in the supermarket aisles, and even if you’re not an expert, chances are it’s not the first time you hear these terms. Today we’ll learn the distinctions between these two grains and see why they matter. 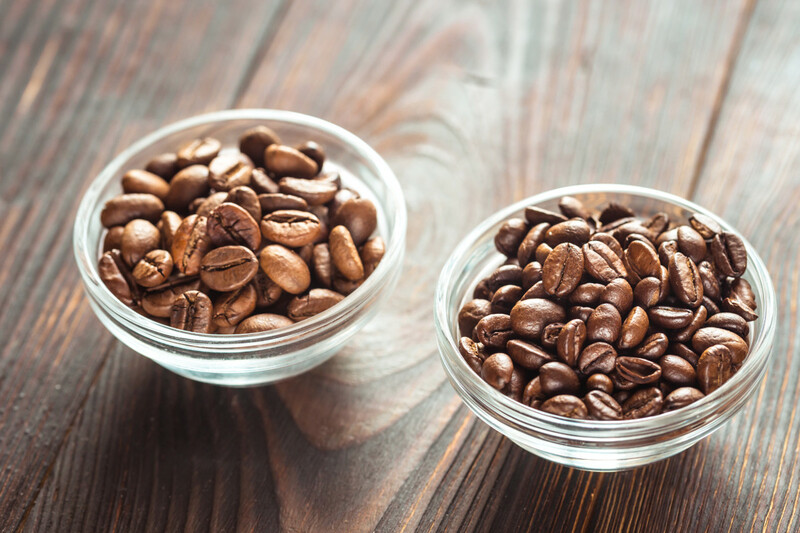 Arabica and Robusta are both players in today’s market because they grow in contrasting climates. The plants have particular needs and behave differently. In high altitudes, you plant Arabica, closer to shore, you’re better off with Robusta. Today Brazil produces 33% of the world’s coffee production, and they are strong in Arabica. Vietnam is a distant second and specialises in Robusta. Almost half of all coffee produced comes from these two tropical countries. Other important producers like Colombia and Ethiopia grow Arabica, and Indonesia grows both but leans heavy on Robusta. In general terms, around 70% of the available coffee is Arabica. I know you shouldn’t have favourites, but we all seem to like it more. Arabica beans are larger than Robusta and have more flavor, more oils, and sugar content. Robusta has almost twice the caffeine than its counterpart, and therefore, it’s bitter. Arabic has a balanced profile and a sweet display of aromas, while Robusta is, well, robust, earthy and rough. Robusta is better when blended with Arabica, a small amount of the robust dark beans gives body and a kick to the subtler Arabica. It is also used to make instant coffee because of its depth of flavor — It’s a tough job but somebody’s gotta do it. Remember, the roasting levels and brewing method will ultimately shape the flavor profile of your brew, but the identity of both, Arabica and Robusta always shine through. Growing Robusta is cheap. It has higher yields and is more resistant to plagues. It’s also easier to tend in the low flatland. Arabica trees need steep land at high altitudes and are quite delicate. Of course, this reflects on the retail price. More than anything else, the quality of the beans in either variety determines its price, that’s why coffee beans are carefully assessed and graded immediately after harvest. Still, Robusta is cheaper. If you’re buying speciality coffee, chances are you’re buying Arabica, but there are excellent Robustas out there, paired with the right brewing method, they might be your cup of tea (uhm!). And because not everything is black or white, try a nice blend and get the best of both realms.